Healthy-K9.com - A very cool present idea for dog lovers & discount coupon for you! Home/A very cool present idea for dog lovers & discount coupon for you! Can you see the purse she’s holding? 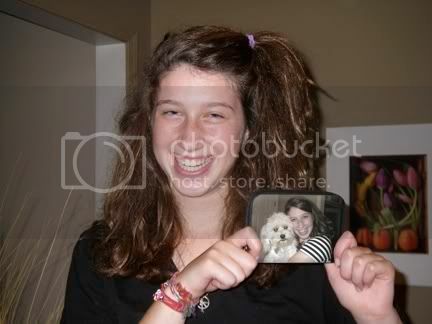 It’s a picture of Hannah with her dog, Munchkin. Read on and I’ll tell you how to get a discount coupon for your own prezzie. I’d like to take credit for choosing it but my wife organized everything, truth is I didn’t even know what we were giving her until she opened it in front of me at the party – haha, busted! It’s an under-statement to say Hannah liked the purse with her and Munchkin, I was walking around with a puffed-chest for the rest of the night because I felt like we gave the best present! I think it is such a great idea, that I got on the phone the next day to order another one for my brother and his dog Tigger (you can get all kinds of bags and purses). I was lucky enough to get the boss when I called, a nice guy and fellow dog-lover…. anyway, we got to talking and I asked if he’d be interested in creating a special coupon for my friends (like you). He was not so keen but after I told him I have about 10,000 friends, I swear I could hear him drooling – haha! So he gave me a coupon number that is good for a $5.00 discount for every order over $50… it’s not fantastic but he tells me he doesn’t make much profit on each item so $5 was the most I could squeeze out of him. I really don’t know how long he will keep the coupon active and please don’t contact my support if you have questions because we can’t help since its not my company… but I’m sure they’ll look after you.